[REVIEW] Naoki Yoshihara by Ash | The zealot of fashion. Hello! Blogging after so long < this is the 123456789 time I've said this. MOVING ON. 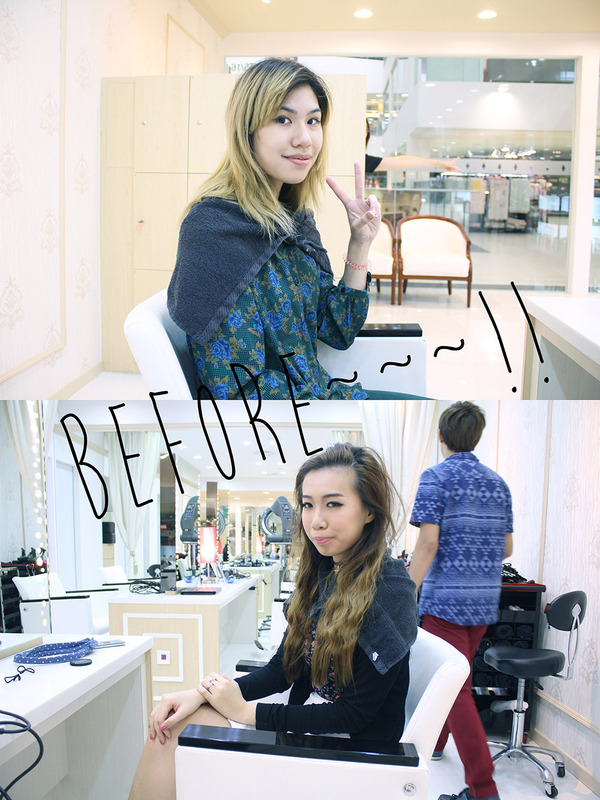 So I went down to Naoki Yoshihara by Ash with Nicole and Pat at Liang Court 3 days ago. They were having this 30% off for all services promotion for first time customers, so we decided to give it a try, mainly because some of our friends have went there before. Well, I have to say, I was not disappointed. Here is us before the chemical sessions begins. Excited and also expecting good results. Nicole chose to cut her hair, touch up her roots and do a moisturising treatment while I bleached half of my head, coloured and did the treatment as well. Fooling around while Nicole getting her haircut! AND THE FRYING BEGINS. For some reasons you can see that my hair appeared lighter than Nicole's. I believe my stylist has used a stronger developer because my hair is generally thick in strands. I never had any problem with bleaching (coincidentally browsing at a blonde girl's photo). Some people with very sensitive scalp will feel a slight burning sensation or sting and people with thin hair (the width of each strand of hair) may have breakage while bleaching. So some hair stylists may not recommend to those who have more vulnerable hair. P.S. My hair turned yellow after bleaching, it is very common among Asian people. Epic selfie with Nicole in our yellow hair. Putting the colour on! I cannot remember the exact name of my colour but I believe it was the 9th shade of beige... The turquoise object over my ears are ear protectors. These are necessary so that the dye will not stain my ears, how professional! TADAH~ Nicole and her new hair! The treatment made her hair extremely soft, it's like she barely even bleached her hair. AND ME!!!!! I LOVE MY NEW HAIR COLOUR! I had never done any ashy-cool toned hair before so I was really surprised on how it turned out! Many who have seen had said this shade suits me and most importantly, my mom loved it! Normally she'd complain about my hair colour and style but she really liked this. This shade made my skin tone look less yellowish and pale which is a plus! I'm not sure you can tell but you can still see a little gradation on my hair because of my inverse dip-dye. I wasn't only satisfied with the colour but the texture of my hair was silky smooth after the treatment. Plus I think I look very dolly and kawaii now HIAKHIAKHIAK! I actually spammed photos while the lady was making my crepe and Nicole was like, "Julian WTF~"
Happygirl with her new hair and her first ever Crepe! If you like my hair colour or wish to go down to experience yourself, here are some details you might find useful! 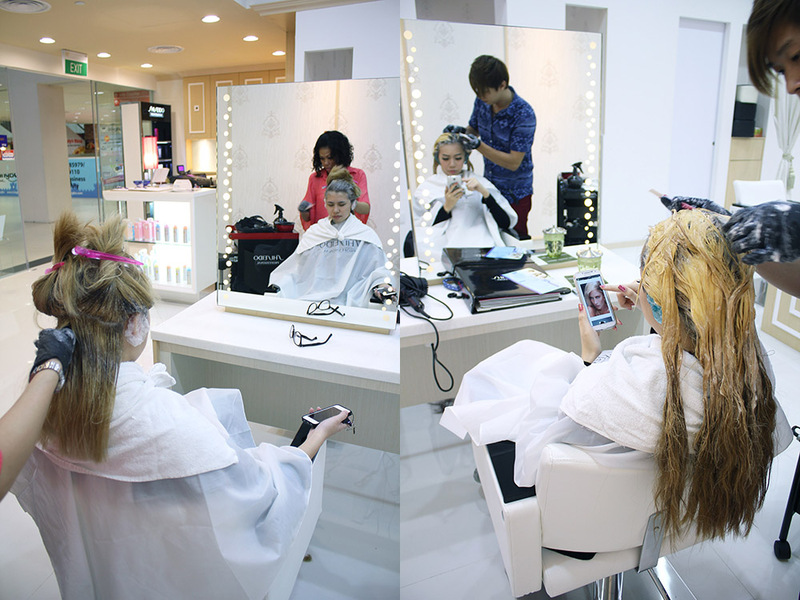 To book an appointment you can call 6333 5662 or 8722 1586 if you speak Japanese. They are open from 10:30am - 8:30pm, closed on Tuesdays. Hope you'll find this post useful! Have a nice Sunday!